Lisa and Malik learn some of the difficulties of marriage. While George and Dallas are still caught up thinking about their "night" together. Tessa continues to think about Ryan. In the first part of the one-hour season finale, relationships are tested when George sells the house, buys Dallas her dream home and Tessa moves out. How many episodes of Suburgatory have you seen? It's a Different Take on Suburbia! A New York City teenager moves from the city to the suburbs not without fighting her father. Anyway, Jeremy Sisto does a great job in playing her father. 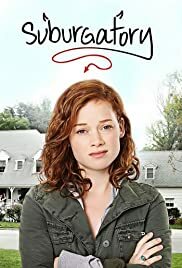 Jane Levy does an excellent job as the teenager. Cheryl Hines plays Dallas, a wealthy suburbanite housewife, with her daughter, Dahlia (reminds you of Paris Hilton). Anyway, the move to the suburbs from the city is like moving to another planet in the daughter's eyes. Things are done differently. Anyway, I enjoy the best part about the show is the casting of Saturday Night Live alums, Ana Gasteyer and Chris Parnell, as the neighbors. I enjoy the show except it is up against another sitcom on another channel. It's hard to choose at times which one to watch. Unlike most sitcoms, there is no audience. Anyway, I enjoy the sitcom overall. I hope it lasts for awhile. We need laughter in our lives today.